There will be an enormous leap in tax bills for private landlords when tax reforms kick into place. 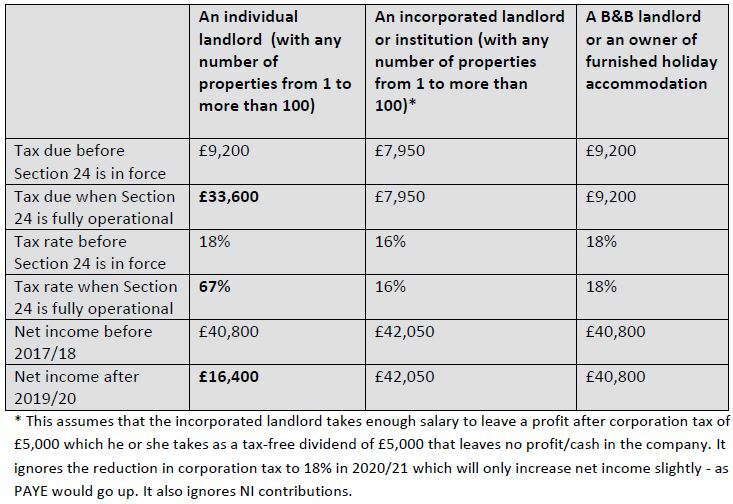 Dr Ros Beck, a private landlord, has done research which shows that the tax bill could almost triple – and that landlords will be effectively paying at a tax rate of 67%. Her calculations are said to have been independently verified. From next month, private landlords will have their current ability to offset mortgage interest against tax gradually phased out by Section 24 of the Finance Act (no 2) Act 2015. This legislation followed last year’s Spring Budget, the last to be introduced by then Chancellor George Osborne. By April 2020, the change will be fully phased in and landlords will no longer be able to claim tax relief against their borrowing costs. Instead, they will be issued with a basic rate tax deduction. The new tax regime will not just affect mortgage costs but other loans – for example, overdrafts and loans to buy furniture. It will apply only to private landlords, and not to those operating in a company structure. She described Section 24 as the “unjust legislation that will make the UK housing crisis much worse”.